Professor Vijay Govindarajan (VG) is one of the world's leading experts on strategy and innovation. He is the Coxe Distinguished Professor at Dartmouth College's Tuck School of Business and the Marvin Bower Fellow at Harvard Business School. Professor VG's latest book "The Three Box Solution" is the outcome of 35 years of research, teaching, writing, and consulting. 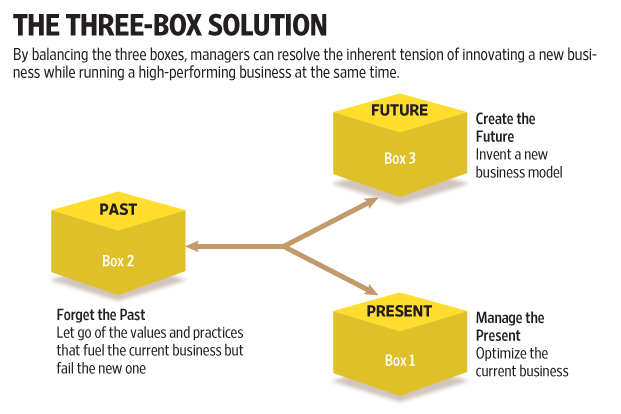 The Three Box Solution is a metaphor for management's approach to innovation. Shorn of technicalities, Box 1 represents the present - the core that is responsible for current revenue and profit streams. Box 2 represents the past - something that might have worked well in the past but is no longer relevant either because of changes in industry structure or technology or new business models or any other reason. Box 3 represents the future - one that is full of possibilities and opportunities, but one that entails considerable risk as well. Professor VG argues that for organizations to succeed in the long-term, they need to constantly strengthen the present - the core - concepts that he readily attributes to other scholars like Gary Hamel and C K Prahalad. In other words, Box 1 is all about performance improvement - Six Sigma, Kaizen, TQM, Zero Defects, Service Quality Excellence, Human Productivity - the list is limited only by our imagination. Professor Clayton Christensen has used the term "Incremental Innovation" for such processes - something that a vast majority of organizations are happy to invest in hoping to reap the benefits of doing everything a little better but without investing a lot and without having a concern for the long-term. Boxes 2 and 3 represent the biggest challenges for management and especially to leaders. How many companies can you think of that have consciously dropped a product line or service offering, or that have got out of geographies that are clearly non-profitable, or segments that cannot be reached efficiently and effectively? Not many. 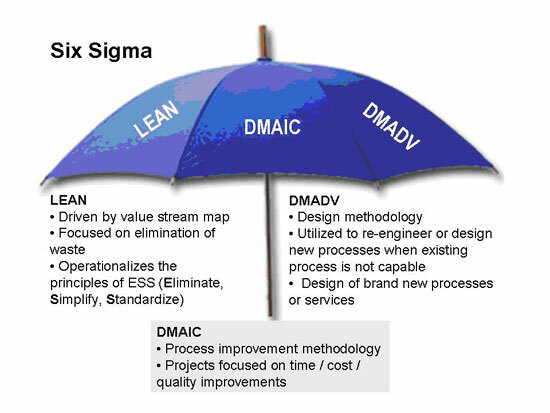 For one thing, organizations do not want to or cannot calculate all the costs, visible and invisible, associated with a process or activity. Thus, there is a tendency to continue with products or services that are no longer relevant because status-quo is very comforting. There is also a kind of emotional bond that prevents organizations from getting out of businesses even when they see there is no future. Box 2 which is about "forgetting the past that is no longer relevant" is a particularly painful decision for organizations and leaders. Box 3 is about inventing the future. Box 3 involves risks. Many ideas fail. Leaders and organizations need to develop a tolerance for failure. Even with the best of intentions, the best of ideas, and the best of efforts, some failure is inevitable. Instead of throwing good money after bad money, organizations need to develop the courage to jettison projects after significant investments have been made if warning signs appear that the results may be far removed from the projections. Empirical evidence seems to suggest that if an organization pursues ten possibilities, one or two may be very successful, another one or two may not result in any significant value creation, and the rest would have to be jettisoned or else would lead the organization to catastrophe. 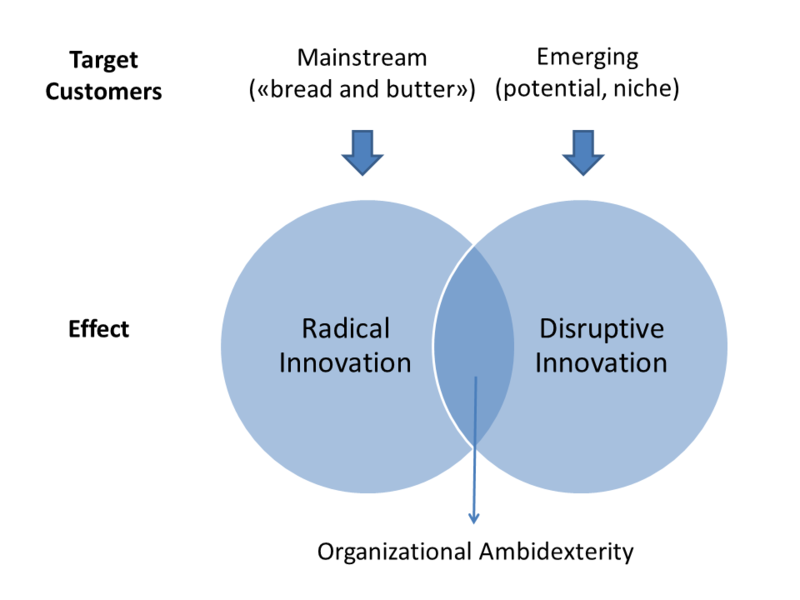 Box 3, in sharp contrast to Box 1, is about "Radical Innovation" or "Disruptive Innovation." There is substantive evidence to suggest that many of the OECD countries have neglected this despite capital being available at zero or little cost and the lack of investments in innovation have led to slowdowns, recessions, and even deflation in some countries. (For more on this, please read "The Capitalist's Dilemma" by Professor Clayton Christensen). As examples, consider Microsoft's obsession with Windows even when it became clear that enhancements to the operating system could not be of a breakthrough nature. The iconic company's fascination with Box 1 inevitably led to missed opportunities in mobile computing, applications, analytics, the internet of things and a host of emergent technologies that have successfully been exploited by smart competitors. Consider also, as an example of the difficulty in embracing Box 2, Kellogg's refusal to quit or even adapt to markets such as India. Nearly two decades after its foray into the second most populous country in the world, the company has still not realized that the breakfast eating habits of a billion people are radically different from that of some other countries. It is not surprising at all that the company's efforts at "incremental innovation" have been a disaster. Now consider the example of Google for a Box 3 application. The company routinely "kills" projects after investing tens of millions of dollars on ideas that initially show promise, but turn out to be not feasible due to a variety of reasons. Yet, the head of innovation is fond of saying that failures are a must when you pursue "moonshot" opportunities and hence no idea is out of bounds for the company. Professor VG cautions particularly about trying to deal with Boxes 2 and 3 within existing structures and hierarchies. The only way to succeed with Box 2 and Box 3 is to have dedicated teams that are insulated from traditional power centers and still have the unconditional support of top management. Like many great ideas in management, The Three Box Solution in essence is a mindset. It is a management orientation that recognizes the importance of core competencies, the need to constantly review products or services or processes or even ways of thinking for abandoning, and the imperative to invest in innovation for the future. The solution is elegantly simple and extraordinarily difficult to practice.